To book the Village Chapel, or the Park, Gazebo and Schoolhouse, please check the Village Calendar for an available date, then confirm your date with the Village office by phone or email. Weekday weddings are available with prior special arrangements made through the Village office. Please confirm your desired wedding date with the Village office before making an online deposit. It is our policy to meet with every potential couple prior to booking in order to answer any questions you might have. If you are unable to meet with a member of our staff prior to making your deposit, please notify us by email before making an online payment. *Deposits are due at booking and refunded only if the Chapel/Park remain in good condition after the scheduled event. The remaining balance is due no later than one week prior to the scheduled event. The Chapel rental fee includes the use of the Chapel for three hours during the reserved time slot, an on-site coordinator, changing rooms, and the use of the Chapel's audio system. The rental fee for an outdoor wedding includes the use of the Gazebo and the one-room Schoolhouse, with two handicapped-accessible bathrooms and ample changing space. Payments made by Paypal are confirmed by an email from the Village office within 24 hours of receipt. If you do not receive a confirmation email within 24 hours, please contact the Village office. Reservation forms and a map of the Village are available for download below. Signed and completed Village rental forms should be mailed to the Village office at P.O. Box 155, Okemos, MI 48805-0155 within two (2) weeks of making your reservation. At the time of reservation, the Meridian Township Parks & Recreation Office must also be contacted at 517-853-4608 to determine whether the park grounds and facilities are available for your event. The Township Park Reservation Form, available for download below, and the township fee ($75.00) should be mailed directly to the Township office at Meridian Township Parks & Recreation, 2100 Gaylord Smith Court, Haslett, MI 48840. 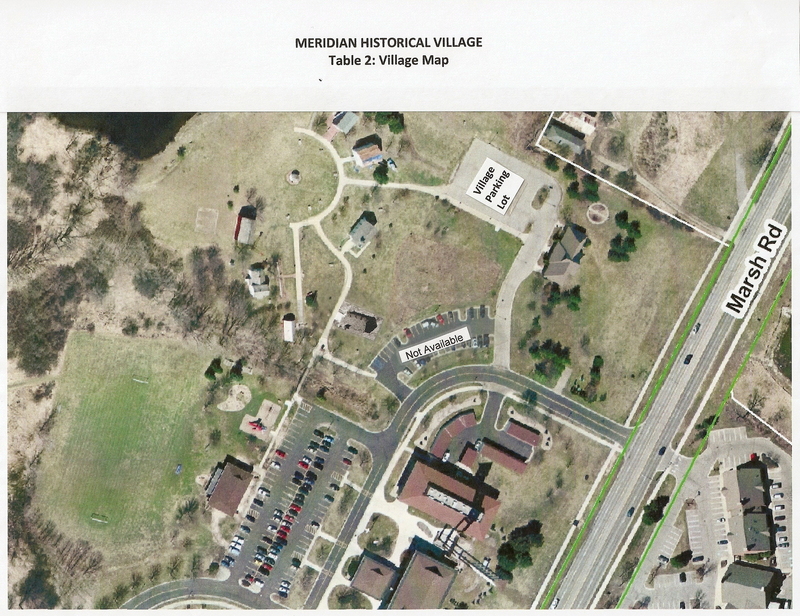 Checks for Township fees should be made payable to "Meridian Township." Click here for help in finding an officiant for your wedding ceremony.